Fitted with heavy lead soles made to U.S. Navy design. Weight is approximately 40 lbs. per pair. DESCO Diving Shoes incorporate a strong Leather upper attached to a solid Maple inner sole. 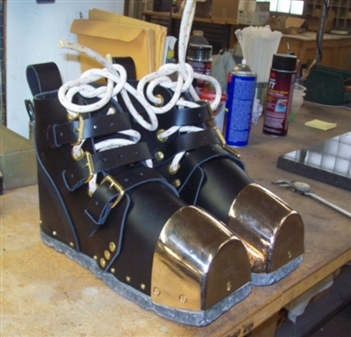 A lead (heavyweight) sole is bolted to the bottom of the Maple inner sole. The shoes are held to the diver's feet with lacing and a strap. The shoes are fitted with cast brass safety toes. All hardware (grommets, screws, bolts & nuts) are made of brass. One size only. Will not fit over modern heavy drysuit safety boots. Shoes will fit over modern drysuit swim boots, or boots on older canvas (Yokohama type) dress. The Uppers are available in Black, Dark Brown, Brown, or Tan leather.